So tickets for Journey are going on sale for the Waikoloa Bowl. 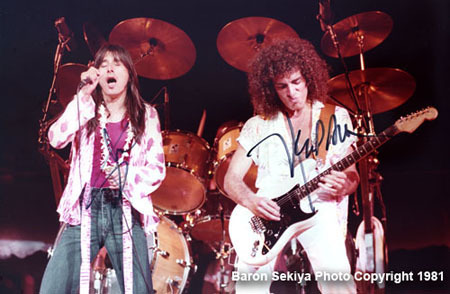 I’ve told folks that I’ve photographed Journey before, twice, and the second time I met the guys and got autographs from their previous island concert on Oahu. So here’s a little proof, a photo of the boys on stage along with their autographs on it. By this time they had replaced keyboardist Greg Rollie with Jonathan Cain and when they looked through my concert photo album and saw Rollie’s photo they pointed at it and said, “There’s Bird.” So maybe that was their nickname for Rollie? 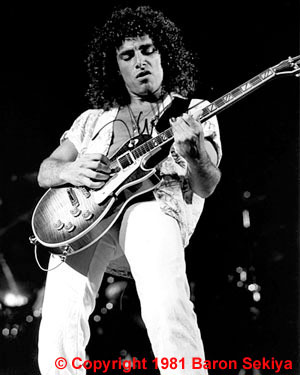 They also saw a photo I have of Carlos Santana and they called Schon over to take a good look saying, “He’s got a photo of Carl.” Since Schon and Rollie both had played in the Carlos Santana band it’s not surprising they were interested in my Santana photos.